Working with some customers to build vRealize Automation 7.x in production environment I have had some problems configuring F5 Load Balalancers, although these errors affected to F5 these mistakes can affect other load balancers as well. These recommendations are based on my own experiences but I based this article on others blogs posts. Just I tried to make a summary. Please don't try to use the load balancer VIP during vRA installation. While if setup perfectly this will work, a small mistake with the VIP configuration can make the installation and configuration of vRealize Automation feel impossible. For this I would recommend you create the VIP DNS record and just point it to your first nodes. Complete your vRA installation and configuration and only after confirming your setup is stable and fully installed to point your VIP DNS record to your actual VIP IP. 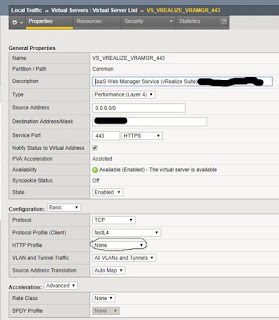 This will make your installation go much smoother, and allow you a much easier path to troubleshooting if you made a mistake during load balancer configuration. The recommended configuration for the F5 Virtual Servers Load balancing type is “Performance Layer 4” and using any different type can cause issues. I would recommend sticking with the supported, recommended, and tested configuration in here. Not setting up Protocol Profile (Client) to “fast L4” in the F5 can cause similar issue to the ones seen in the above point. Same bad result. By default, F5 is configured with the HTTP Profile of “http” , which does not work well with vRealize Automation. The correct value is "none". The behaviour to leave this setting with "http" is undefined, sometimes work sometimes does not work. Looks unstable. With "none" the F5 works normally. 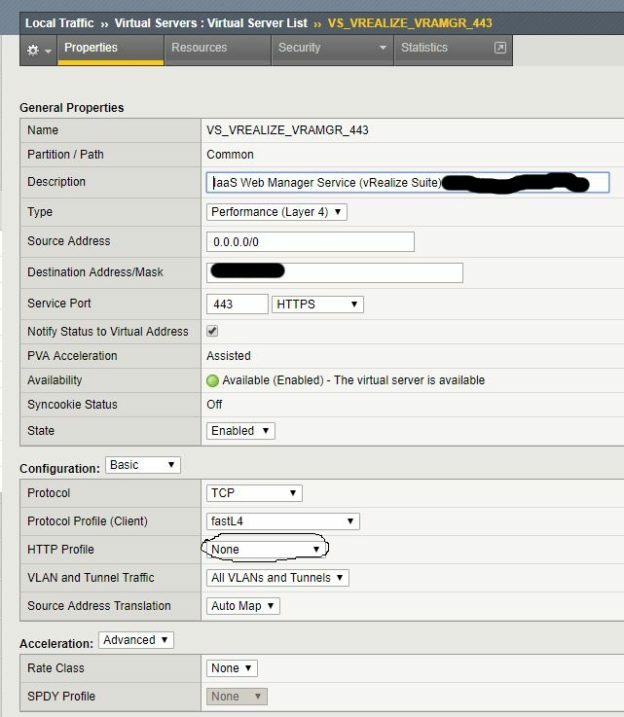 I hope this help some of you fix some issues caused by F5 load balancer configuration when creating a vRA distributed environment.